Car rental is easy using our web form to find the cheapest rental car in Zaragoza. We compare car rental prices for you in 30,000 locations so you will get a dream rental car with the best price ever with our car hire services! We’ll offer you the most affordable car rental deal in Zaragoza Downtown, Zaragoza Train Station or right in the Airport. Now you don’t have to compare car rental companies – just add your location and we’ll do it for you! 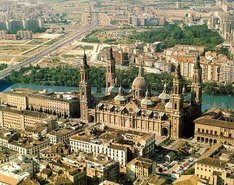 With our car rental Zaragoza you can admire the ancient architecture of Zaragoza Old Town or Casco Viejo, visit lots of unique restaurants and tapas-bars offering local courses like Ternasco Asado (roasted lamb meat), Pollo al Chilindrón (chicken with a special sauce) and other delicatessen. And you should mention great shopping opportunities there! RentalCars24h.com offers you reliable car rental Zaragoza services that will help you to feel free and independent when moving around the town. Providing best online prices for car hire Zaragoza services, RentalCars24h.com allows you to save money each time when you rent a car in Zaragoza.